I could kiss George Foreman! We are on our 3rd George Foreman Grill. Not because we had to replace them but because George keeps making them bigger and better. Our current model is the George Foreman Next Grilleration with variable heat settings and 5 removable plates. It includes the grilling plates, waffle plates and a special flat baking plate. It's a great way to make fast and easy healthy meals without using your stove or oven. The grilling plate is the one we use the most. It's one of the reasons we have been able to change our diet and eat better this year. We make several main dish items on the grill- burgers, chicken, pizza, and fish. We gave up beef burgers for a lower in fat turkey version (see recipe). The turkey burgers are very mushy in their raw state and need to be cooked from frozen so they stay together. This is no problem on the GF. The burgers have nice grill marks on the outside and are completely cooked on the inside. On the rare occasions we do opt for beef burgers we know we are getting much less fat by making them on the GF. Boneless chicken breasts are probably my favorite thing to cook in the GF. You can grill them plain with a bit of seasoning, bbq sauce, or go all out with an endless variety of marinades (see recipes). I grill a large batch of chicken breasts when they are on sale then dice and freeze them on a waxed paper lined cookie sheet and store in a Ziploc freezer bag. I use them in chicken soft tacos, casseroles, pasta salads or on BBQ chicken pizzas. Mini pizzas are a snap with the baking plate. I make my own whole wheat pizza crust but store bought is just fine. Simply roll out a thin piece of the dough to fit the baking plate and grill until it just starts to brown. Add toppings and sauce and close the lid until the cheese is melted and bubbly. If you like grilled veggies - toss your favorite veggies in oil and grill them as well - then use them to top your pizza. Fish isn't exactly a favorite at our house but we try to eat it once a month for the health benefits. It's so easy - I buy a frozen fillet at Trader Joe's, thaw it and slather it with olive oil mayonaise. Sprinkle it with lemon pepper or your favorite fish seasoning and grill it. Some people complain about cleaning the George Foreman Grill but I've never had a problem. As soon as I'm done cooking I unplug the grill and wet a few sheets of paper towels. Place the wet paper towels in the (still hot) grill. In about 20 minutes the grill will be cool enough to handle and any stuck on food has been steamed loose. Clean with a sponge or use a dish brush that's safe for non-stick surfaces. All George Foreman Grills come with a few recipes in the instruction booklet. 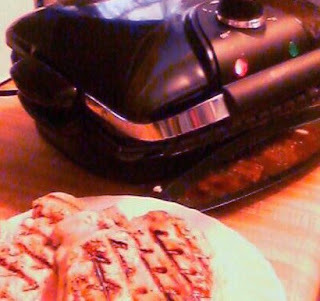 There are more recipes on Salton's website and in George Foreman's Indoor Grilling Made Easy. I love Steve Reichlen's book The Barbecue! Bible. I just spotted his book Indoor! Grilling at Amazon.com and added it to my Amazon Wish List. Yahoo groups also has a group of GF fans who exchange tips and recipes. Hi! Nice to meet you. I see that you are a follower of my blog. Interesting to read your post as just this afternoon I was cleaning cupboards in my kitchen and mentioned to my husband that we never use our George Foreman Grill these days. I will have to remedy that.